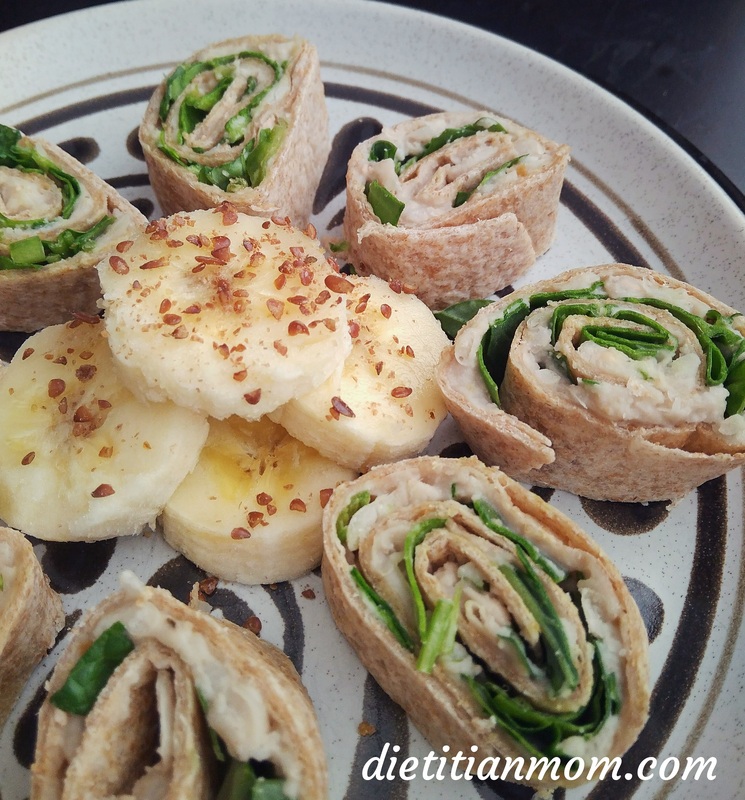 This nutritious protein-packed recipe came when I was rushing to put lunch on the table for my preschooler before she had to leave for school. I literally created this meal in about 10-15 minutes, and both children loved it! I even enjoyed it myself (as a roll) and my husband did too for lunch later in the week. This is an egg-free, dairy-free and oil-free recipe, but it can also be gluten-free if you use gluten-free tortillas. It is such a simple, yet filling meal. These Vegan Bean Tortilla Bites taste best when made the day of and are super fast to put together if you’re packing lunchboxes in the morning. A nutritious vegan, egg-free, dairy-free, oil-free quick mealtime option for school, work or home. Wash the spinach leaves and dry them well with a paper towel, before chopping up the leaves into smaller pieces. Warm a tortilla in a large saucepan or skillet on a low heat setting (if you don't have time, you can skip this step). Mix the fortified plant-based milk with the nut or seed butter, stirring until a creamy sauce is obtained. Mash the cooked or canned white navy beans with the creamy sauce until well mixed together. Add a pinch of salt & pepper if desired. Remove the warmed tortilla from the skillet and place onto a large plate. Spread on a third of the creamy mashed bean mixture. Top with the chopped spinach leaves. Roll up the filled tortilla like a carpet, and slice into spiral bites. Repeat this process with the other tortilla wraps. This is a basic set up, but you can add other filling ingredients if you want, such as sliced bananas, sweet potato, or vegan ‘cheese’ shreds. If you don’t have spinach leaves, you can substitute other leafy greens like chopped baby kale leaves, romaine lettuce or use a mix of baby spinach and baby kale leaves. If you are using regular canned white navy beans (not the unsalted kind), these will likely already have salt as one of the ingredients. Check the ingredients of the can. If so, you may not need to add any salt at all. Taste the filling to see if you need to add additional seasoning. You can also try this recipe with other types of cooked beans like white cannellini beans or red kidney beans. 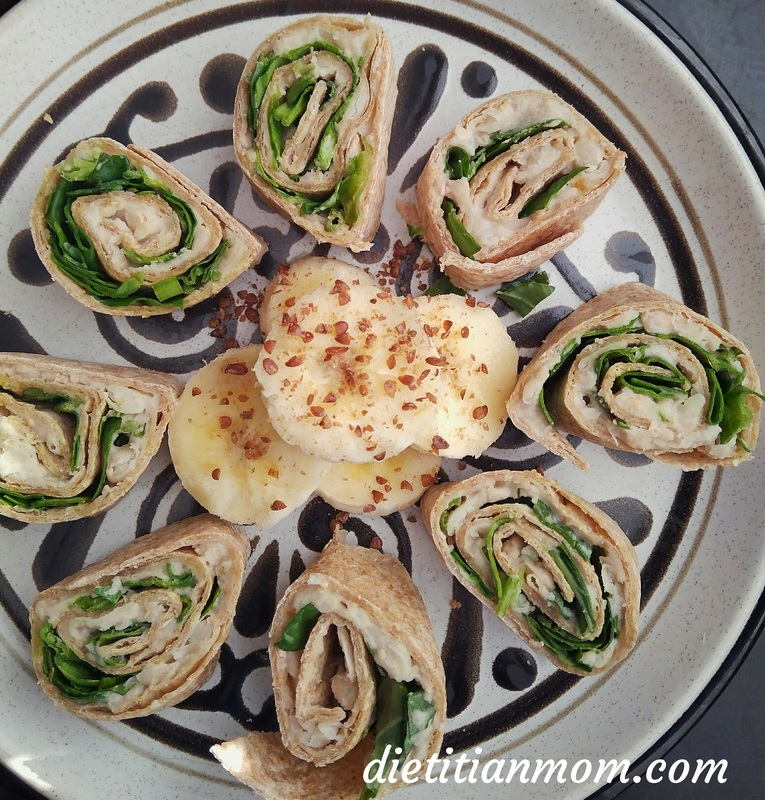 Take these tortilla bites or whole rolls with you to work for lunch or pack them for your children’s next school meal!